BLACK FALCON: (walks up to Kendall, rips his headphones off) Kendall, I have a question for you. BLACK FALCON: It’s the Black Falcon. BLACK FALCON: Black Falcon. It’s my name. I am the BLACK FALCON. BLACK FALCON: Not right now, Kendall. MARSHALL: What do you mean, not right now? The biggest game of your career is tipping off in half an hour and you don’t wanna talk about it? What could possibly be more important? I was wondering if I could run a few things by you. MARSHALL: Oh, Jesus, not again. BLACK FALCON: Y’see, in Chapter 8, different manners of marketing are discussed. Now, I understand that for effective marketing, I have to focus on a specific portion of the market–a consumer demographic, if you will–and feature a product that will appeal to the members of this group. However, I don’t know how to go about this market segmentation: I think that everyone should be interested in this, and I don’t want to prevent anyone from gaining access to it. Your thoughts? BLACK FALCON: I agree, Kendall, it’s quite confusing. Should I pursue a broad market strategy or try to pinpoint my consumers in specific segments of the market through complex price discrimination mechanisms? MARSHALL: Your consumers for what? BLACK FALCON: For what? You must be joking. My brand, Kendall. My brand. Y’know, me as the basketball player, me as the person, me as the humanitarian, the media mogul, the inventor, the star of many viral internet marketing campaigns, the spokesperson for electronic goods retailers such as–but not limited to–RadioShack and Best Buy, and eventually, me as the Governor of Iowa and Ambassador to that planet in Space Jam where all the Monstars were from. BLACK FALCON: I mean, I don’t want to get ahead of myself, but it’s something I’ve been thinking about since my second grade teacher, the wonderful Mrs. Robinson, told me that I can be anything I want to be. And honestly, I want to be a lot of things. BLACK FALCON: So, Kendall, what do you think? BLACK FALCON: Absolutely, give me your honest take. MARSHALL: Well, I think you should focus on becoming the type of person that people want to have work for them. Michael Jordan probably has the strongest brand of any basketball player in history, but he has no business sense: just look at how he runs the Bobcats. If you’re good enough, you’ll land on your feet. MARSHALL: And really, it has to start with success on the court. You have to be an unbelievable player, and most importantly, a winner. Which is why–(gritting teeth)–IT WOULD BE GREAT if you could maybe focus a little more on this game right now. Because if we win today and you have a great game, that’ll do more for your brand than any damn studying will right now. It’ll also help out the–uh, y’know–the team. That you play for. BLACK FALCON: What utter nonsense. You, sir, clearly know nothing about how to create a brand. Not once in those statements did you say anything about a BLACK FALCON sign in big neon lights all along Franklin St., or maybe a BLACK FALCON BOBBLEHEAD where it’s like, half-me BUT ALSO half-falcon? Those are business ideas you can take to the bank. MARSHALL: Okay…I’m gonna go talk to Stilman for a bit. BLACK FALCON: Hey, tell him there’s room for a WHITE FALCON sidekick! No great superhero works without a sidekick! Especially a superhero with a brand! BLACK FALCON: (to himself) I think that went well. The BLACK FALCON sits back down at his locker. He puts his book away, and pulls out his iPod and headphones. He queues up the soundtrack to The Color of Money while reading his notes for the game, which consist entirely of quotes from Gordon Gekko. From this pregame ritual, he gains a natural high and falls into a state of pure bliss where he remains undisturbed for the next three hours, only briefly rising out of it when Roy mentions how many people will be watching the game (“great marketing potential,” the BLACK FALCON notes). Incapable of any sustained muscle coordination, he shoots only 5-14 from the field, misses his last six shots, and only puts up 5 second-half points. 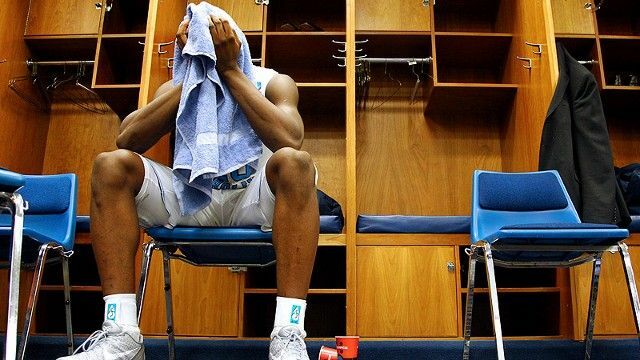 Kansas pulls away at the end of the game, and UNC’s season ends in crushing fashion. The BLACK FALCON is upset with the loss, but excited that the season is over so he can focus on other things. Reporters huddle around his locker, eager to ask about his performance. REPORTER 1: Harrison, Harrison. Over here. Tell us about what happened out there on the court today. BLACK FALCON: Well, first of all, I’m not exactly sure. But let me ask you a question, sir. What network do you work for? REPORTER 1: I work for ESPN. BLACK FALCON: (disappointed) Really? You, ma’am, who do you work for? BLACK FALCON: My word. Listen, I appreciate everyone coming by here, but I really don’t want to talk about the loss. It’s too painful to discuss. UNLESS you work for The Atlantic, Forbes, The Economist, the Brookings Institute, or the Wall Street Journal. BLACK FALCON: No one? Seriously? Any venture capitalists? Warren Buffett? Is that you? BLACK FALCON: This is the worst day ever. This entry was posted in Miscellaneous, UNC and tagged Fun With The Black Falcon, Snark Alert, Way Too Soon. Bookmark the permalink.